The programme, which is run by the Small Enterprise Development Agency (Seda), aims to help 40 promising firms to grow the value of their business 20% year-on-year over three years, with a mixture of business support and access to grants of up to R1-million (from the Department of Small Business Development) to purchase machinery and equipment and fund training. So far two cohorts have been launched — one in March 2016 and another in June 2017. But almost three years on — and just weeks before Seda is due to embark upon a review of the intervention — a Ventureburn investigation has revealed that the programme has little to show for itself in terms of the number of jobs created and the revenue growth of participating firms. This, while participants are up in arms over having to wait months on end — and sometimes over a year — to receive grants that the department promised them. 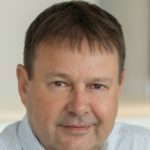 WAM Technology CEO Johan van Wyk said he waited over a year for the department to pay out his grant of R800 000, for equipment such as laptops, computers and a new server. “From our side the paperwork was always in place, but we always needed to submit three quotes from suppliers and they (the suppliers) didn’t always have tax clearance,” he said. This, and the fact the department’s adjudication committee sits only once a month, he said, had contributed to the delay. Lab24 co-founder Daya Ramparsad said he’s still waiting on a R400 000 grant he applied for in June 2017 to fund three delivery vehicles, two motorcycles and analyser equipment. The business provides pathology tests and is part of the second cohort of the programme. “The most frustrating thing is that there’s no transparency and there’s a breakdown in communication,” said Ramparad, who called it “morally wrong” for the government to lead businesses on by offering them grants and then not disburse them timeously. Likewise, Khaya Cokoto, who runs software development company X-Spark with Sapho Maqhwazima, said since June 2016 she and her business partner have applied three times to access part of a R1-million grant, but without success. The two initially wanted to use the grant to fund the purchase of vehicles, cables and machinery for a cabling contract the firm had clinched. When the grant didn’t come through the two took out a bank overdraft to finance the contract. The overdraft however left the business overextended and Cokoto and Maqhwazima had to turn down other contracts. “We’ve missed a number of chances to grow by missing funding,” said Cokoto. Compliance Online founder Minette Smit ended up having to pay suppliers from her own pocket after waiting months on end for a R223 000 grant for computers and videos she applied for. This, she said impacted her business’s cashflow (though she could not say exactly how). Smit said while Seda refunded her within three months, the agency initially took so long to approve a supplier’s quote that the quote had climbed to R260 0000, leaving her to pay the difference of R37 000 out of her own pocket. “You have to call them to know what’s happening. There was no proactiveness (on their part),” she said. This is echoed by Innovo Networks founder Damian Michael, who said he recently applied for a grant to fund software licenses and servers for the third time in November last year and is still waiting for it to be approved. Michael said he’d written to and called Seda several times to enquire about his application. “You just don’t get a response. Nobody cares, no one wants to give you feedback (on your application). It’s like sending an email into a blackhole,” he said. He said the way the programme has been run has left him baffled. “You’ve gone through this rigorous process (to get selected) and then they don’t support you,” said a frustrated Michael. Recently Seda requested the department to allow the agency to process grants, so as to speed up their approval and disbursement. The department would likely have to get approval from The National Treasury to do so. 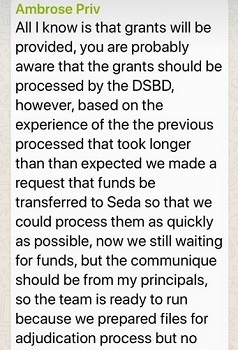 In a copy of message obtained by Ventureburn that was sent yesterday (6 February) at 6.35pm to a Whatsapp group for firms on the programme (see below screenshot) — Seda’s Ambrose Makgwale, who manages the programme tried to allay the concerns of frustrated business owners. Whatsapp message sent by Seda’s Ambrose Makgwale on 6 February, to those on the programme. “All I know is that grants will be provided. You are probably aware that the grants should be processed by DSBD (Department of Small Business Development), however, based on the experience of the previous process that took longer than expected we made a request that funds be transferred to Seda to that we could process them as quickly as possible. “Now we are still waiting for funds, but the communique should be from my principals, so the team is ready to run because we prepared files for the adjudication process but now funds from the department yet,” writes Makgwale. But the lengthy time it’s taken to approve grants isn’t participants’ only concern. They say the training and business support offered by the programme had not always been useful. X-Spark’s Cokoto said while some of the training — such as tech training offered by MTN — had proved valuable, a market-access intervention by T-Systems failed to materialise. “After that people followed up and nothing,” she added. She said webinars offered by a trainer proved “absolutely useless” as most were not geared to the IT sector. For Van Wyk the programme put him onto an expo in China which he attended in November and which the Department of Trade and Industry funded. However he pointed out that none of the market access support promised for participants materialised. In addition, Innovo Networks’ Michael said while some financial management and tax advice proved useful, much of the advice was pitched at first-time business people. And very little help, he said, was given to access the supply chain of corporate and state-owned enterprises. Among just the IT firms in the sector that took part in the programme, few created jobs. To qualify for the programme firms must be at least two years old, have an annual turnover of between R1-million and R30-million and employ at least two people. There are eight IT or technology-related companies in the two cohorts. Yet just two of the five IT and tech businesses that Ventureburn surveyed have been able to create jobs — no more than six or seven jobs among them. None of these businesses appear to have met the programme’s key target of growing their valuation by 20% year on year. Lab24’s Ramparsad reckons that his business, which currently employs 27 people, has added two or three jobs since joining the programme but attributes this mainly to marketing the company has carried out, not to any help from the programme. X-Spark’s Cokoto said her business had not seen its value increased by 20% year on year since the company joined the programme in mid-2016. The business employs eight full-time staff — about the same as it did three years ago. WAM Technology’s Van Wyk said since joining the programme in 2016, the business had hired four new employees and now had 20 employees. While he said revenue had not increased by much in 2017, because big clients had cut spending, 2018 saw an increase in revenue of eight to 10%. The business provides an electronic register for reportable diseases such as TB and HIV and is mainly funded by the US’s Centre of Disease Control (CDC). Its main clients are the US government, as well as South Africa’s Department of Health and some local municipalities. While Van Wyk says the new computers have helped his staff to work faster, he admitted that the plan is not to grow the business too fast, but to keep it as a family-run firm. Not exactly a gazelle mindset. Compliance Online’s Smit, who has been running her business for over 15 years, employs just five people (the same number as another gazelle in the sector — Innovo Networks). While no new jobs were added since she entered the programme she says her turnover did grow by 30% in the last year. Seda CEO Mandisa Tshikwatamba (pictured above) said the department has granted 59 applications for funding since the programme’s inception. She did not say however how many of these the grants have been disbursed. She said only that about R30-million in grants have been approved so far. Seda took over the management of the Gazelles programme in May last year. Previously the programme was being managed by business consultancy Mtiya Dynamics, until the contract between Seda and Mtiya Dynamics came to an end in April last year. Tshikwatamba said as at April last year a total of R24.8-million in grants had been approved, while a further R6-million had been approved since April last year. In all, R20.2-million had been disbursed so far, she said. She said new applications to the value of R12-million and more will be processed before the end of the financial year on 31 March. What then of the performance of those firms on the programmes? While Mtiya Dynamics in 2017 reported that the first cohort had grown the value of their businesses by a mediocre average of seven percent in the first year of the three-year initiative (see here), Tshikwatamba said a “significant” number had in 2017/18 (the second year) been able to increase their business value by more than 25%. Figures provided by Tshikwatamba to Ventureburn appear to contradict the performance of the five IT firms that Ventureburn surveyed. Her figures reveal that the first cohort of 40 were able to create 365 new jobs up to March last year (growing from a total of 707 jobs to 1072 in two years), while firms in the second cohort created 140 jobs (from a total of 271 to 411 jobs in about eight months). This translates to an average of six jobs created per firm for both cohort. In addition, seven firms from the first cohort were able to grow their revenue by over 30% between March 2016 and March 2018, while five from the second cohort saw an over 30% increase in review from June 2017 to March 2018. The remainder of firms from both cohorts mostly grew by under 30% or experienced no growth. Four firms from the first cohort and six from the second saw their revenue decline over their respective reporting periods. 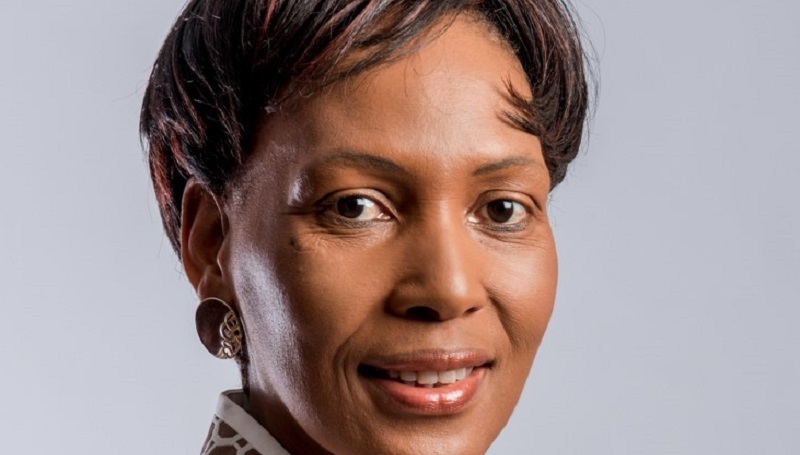 Tshikwatamba said she was confident that the second cohort had a better chance of succeeding under Seda’s management, as the agency had entered into partnerships with various stakeholders to ensure that the set programme goals are achieved. She said a formal performance review of the programme will take place once the first cohort of Gazelles completes its three-year term in March and the second cohort is on a halfway mark to the end of its three-year term. “Once the review is completed and learnings are integrated in order to make the programme more effective we will then put out a call for new applications (for a third cohort),” she said. She said while the review is set to take place this year, she does not anticipate that it will lead to any “material” programme changes. Meanwhile Seda has put out a tender for an organisation to operate an accelerator for the Gazelles programme. Seda spokesman Boy Ndala told Ventureburn that the tender is not to replace Mtiya as a service provider. “Seda will still be project managing the Gazelles programme, and providing the majority of business development support,” he said. Ventureburn sought comment from the Department of Small Business Development on why the department’s adjudication committee is currently taking so long to approve grants. The department’s spokesman Noku Manyelo did not respond by time of publication. Ventureburn also contacted Zulu’s special advisor Thami Mazwai who conceptualised the programme, but he declined to comment, saying as an advisor to the minister he was no in a position to do so. Mazwai was the former chairman of Mtiya Dynamics which he founded in 2011. Fin24 revealed that Zulu has said Mazwai agreed to dispose of his stake in Mtiya (which was reportedly 40%) when he became Zulu’s advisor. While Mazwai hung up when Ventureburn asked whether he had indeed disposed of his stake in Mtiya Dynamics, the firm’s CEO Zukile Nomafu confirmed yesterday that Mazwai had disposed of his shares to existing shareholders. Read more: How much can SA’s Gazelles programme really help high-growth businesses?